IDW? Or as I best know them, the people who print the hardbound Spider-Man newspaper strips (starting as the beginning). You just can't escape the wall-crawler. It's like your caught in some kind of... I don't know, nylon net (like a basketball hoop). That seems apt. Tell them not to stop printing them. Oh yeah, and let us know if there is a plot for your comic that can be discussed. 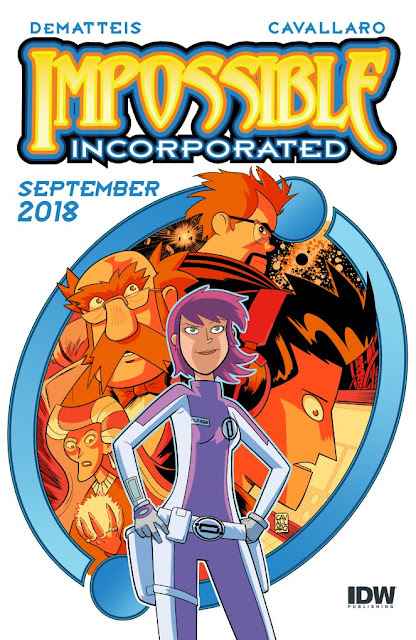 Without getting into too much detail, it's a big, fun cosmic story about a teenage genius, the daughter of a legendary, missing adventurer who's kind of half Reed Richards, half Doc Savage...only Jewish. And I'll let it go at that! wait, wait, wait, that can't be the end of explanation. You had me with cosmic, and lost me with teenage genius. No good teens... always mocking my trousers. But, why mention Jewish? Is the Torah involved? Maternal guilt? Love of latkes (even though they aren't Jewish in origin)? Why isn't it just a fact? It is implied that it is rather a major factor. I mentioned that she's Jewish because the heroes of these stories rarely are. No torahs or latkes in sight. You don't know that, excluding extra-terrestrial ones, religion and/or ethnic background are rarely mentioned. WASP/Jewish/Polish/Lutheran/Buddhist/Greek/Romani... they could be anything. You name dropped Doc Savage, while he likely isn't Jewish, there is no evidence to the contrary that I know of, and FRED Savage (actor/director) is Jewish. Seems like you are jumping to conclusions. Can she use her crazy space gadgets on Saturday? How does she know if it is Saturday in space? In space, no one can hear you pray. Depends on if you have a radio or not. Even then it is spotty. The first words on the moon were actually "This is one small step for A man, and one small step for mankind"
NASA actually had it already prepared. The radio transmission just lost the word "a." Yeah, I knew that. Makes a lot more sense that way! Back uo here. Why "no latkes in sight?" Do you hate your own creation so much. After she eats them, and gain enlightenment obviously, does she then say that her mom made them better. Now THAT'S Jewish. Mom or grandma ALWAYS made them better. It's The Jewish Way. I'm still stuck on the image of a Galactus-size Kirby latke. Wait. Now it's Galactus sized? When did that happen? Where do you get potatoes that big? Who's frying them? Is there enough applesauce in the whole of the universe? New book sounds awesome. I can't wait. Also, now I want latkes. I remember when this first got teased several years ago. Glad to see it's finally happening! And it goes without saying I look forward to reading it. Thanks, David! Yeah, it's taken us a while, but I hope you enjoy the result!